It is a truth universally acknowledged that an economically independent professional woman in her thirties must be in search of a soul-mate and will ask herself “Why are all the men round here so rubbish?” When this happens, the logical thing to do is to crack open another bottle of chardonnay, unwrap a big bar of Dairy Milk, and curl up with a good DVD. Some women may vow there and then to do ‘something’ about it and Jennifer Cox was one of those. Rather than signing up for a class in car maintenance, taking up SCUBA diving or signing up for online dating, she decided that if London wasn’t big enough to provide a soul mate, she’d take on the world. She’d already observed that foreign men always seemed more interested in women than the ones she found at home who seemed to find it a challenge to tie their own shoelaces and use a knife and fork. 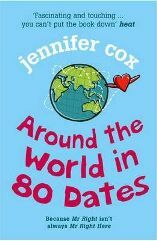 Thus was born the idea behind “Around the World in 80 Dates” (ATWIED) or as it was cruelly dubbed by some wishful-thinking would-be daters, “Around the World in 80 Lays”. In a flash Cox has pinged off emails to friends and contacts around the world and set up a network of potential dates across Europe, North America, Asia and Australasia. “So that’s me packed and ready to go; passport, touche éclat; little black dress and the names of 80 men I’m going to date in 17 countries over the next six months”. It’s not quite like Scott of the Antarctic counting his horses and huskies and cans of Spam but this one woman was standing on the edge of a personal adventure designed to find love (and a book contract/magazine articles/film script though it’s not always clear which was the more important mission). It’s a tale of the internet age; one that shows that the world is compressed by modern communication tools and decent hotel chains. First, let’s get to know a bit about the woman herself. As a travel writer and broadcaster, Jennifer Cox was no stranger to meeting and greeting people the world over. Her CV included head of PR and spokesperson for Lonely Planet for a decade, presenting BBC Holidays and co-presenting BBC1’s ‘Perfect Holiday’, writing for national newspapers and magazines. Cox must have designed her experiment with her eye on the PR and publishing opportunities and I did sometimes wonder how she was financing her travels and concluded that it must be on the basis of a book advance. Personally I didn’t have a clue who she was and didn’t recognise her from her photos on the book cover, though she’s been popping up a lot in travel magazines since then. The point that I’m trying to make is that the average girl in the street probably doesn’t have the money, the job, or the Rolodex/Palm Pilot of international contacts that would be needed to put on a stunt like this. She set off to Europe first, bouncing around Holland, Sweden, Denmark, France, Spain, Portugal, Greece, Italy and Germany, clocking up the first couple of dozen dates, sometimes with two or three in a 24 hour period. Some of the dates were pretty dodgy like Frank, the sleazy Dutchman (what is it about Dutchmen and their supreme self-confidence that ensures they’ll always ‘have a go’ regardless of whether they get any encouragement? ), the tulip-shredding weirdo, the yukky ‘brother of a friend’ who bailed out when he realised she wasn’t really sleeping her way around the world. On the plus-side there was the very fit Swede who hired a floating sauna for the day and the Viking who took her to Viking camp (lots of log splitting and hearty activities). The more ridiculous included the mime artist from Las Ramblas in Barcelona who turned up in silver body paint and lycra and the Italian who had ‘married’ a dead woman he’d fallen in love with after visiting her grave. At times like this, the odd bloke with the squint from the accounts department does start to look like not such a bad option. Cox learns some of the basic differences about men and women – that men seem to think any date that involves boats is romantic, even if you’ve already told them you are ridiculously prone to sea-sickness and that some of the male date organising friends are a bit too controlling and keep setting her up to do things that THEY think would be fun – take for example the guy who sets her up with his friend the pilot to go in a bi-plane which ensures scarcely a word get exchanged throughout. Chances are that if you consider reading the book, you may well know that part way through Cox thinks she’s found her soul-mate. I’ll say no more about whether it works out or not but I have to say that once she’s smitten the book definitely takes a turn for the worse. After all, what’s a girl with a book contract based on dating 80 guys to do if she loses the will to finish the job because she’s gone ga-ga for some hunk part way through? Too much soul-searching and too much going on and on and on ensues before she decides she’d better get back on the road and finish the job. But somehow the spark’s gone out of the mission for Cox and for the readers. Will she get to the end? Will we really care if she does? Does any of it really matter? I expected poorly written fluff but I admit that I was wrong. Cox is a good writer who draws you in, amuses you, makes you care (well some of the time) and delivers a very different approach to the whole ‘dating in the new millennium‘ debate. At times I wanted her to be a bit more experimental – to step out of the “different city, same middle class white guy” groove and date a Kalahari bushman, an Inuit, a few more locals and a few less expats. We can’t draw too many conclusions about how men vary around the world if our heroine is just dating the same sort of bloke and merely changing the location. I also can’t help but feel sorry for some of the dates – after all, what was in it for them? Surely it wasn’t the chance to take a British girl out on a date, show her a good/bad/mediocre time and then have her write nasty things about you in a book when she gets home? Some of these guys must surely have cringed to see what she said about them and others were surely desperately disappointed to find they only warranted a few brief lines. All in all, it’s a very selfish premise for a journey – all about ‘me me me’ and rather exploitative of the other 80 human beings sharing the experiment. The cover classifies ATWIED as a ‘travel’ book but you really won’t learn anything significant about travel or the locations visited – which is really a crying shame. To be honest, she could have done all 80 dates in the British Isles and saved a fortune on flights. But if you can get it cheaply, it’s a nice enough little book – just don’t expect to learn anything of any significance. No Comments on "Around the World in Eighty Dates"